Are you a bodybuilder who’s ready to take your flexibility and mobility to the next level? Then How to Be a Supple Leopard can help you fill in the missing piece of the puzzle called mobility. I’m a big believer that today’s bodybuilders MUST master the art of mobility, exercise execution and self maintenance to continue to live pain free. When I started bodybuilding back when I was 16, all I had for resources was Muscle Mags and some TV show they filmed in Hawaii with some huge dude who didn’t look like me. A lot has changed since then thankfully and with technology, much of that can be shared. After thinking about this at the beginning of the year, it dawned on me that bodybuilders, us traditional types, are really lacking in the mobility and flexibility departments. So much emphasis is put on nutrition and training that “warm up” or mobility is pretty much foreign and most people in my circle don’t do it. Or if they do, it’s so vague that you are left with buzzwords and nothing concrete that is actionable. Pain is a signal from your body that something isn’t right. If you listen, it is your chance to see if you can fix what is wrong so you can get back to living pain free. Why not combine the best of both worlds? Take the knowledge of mobility from the CrossFit community and apply it to my traditional bodybuilding workouts? That’s what I’m thinking. On the other hand, you have this movement called CrossFit that appears to do Olympic style lifts (read A doctor’s view of CrossFit) yet they are taught mobility from the start. They don’t do a few static stretches here and there. They have learned something that I think our circle (talking about bodybuilders here) is lacking, forgotten or was never taught. It’s never too late to fix what ails you. Raise your hand if you read the autobiography of Arnold Schwarzenegger? Do you remember the part where he goes into elicit details about his warm up routines, stretching, dynamic mobility, working on tight hip capsules to improve his squat? How he dealt with knee flare ups and how he used bands for flossing to distract his knee so he could loosen it up? Maybe how to put your spine in a stable position for any lifts you do? And that’s not a dig on Arnold or the book. It’s just meant to illustrate that bodybuilders generally do not focus on the elements that limit movement and performance. If anything they mention “stretching” and fixing your form. Too general to be useful. My point is that certain generations were never taught anything about mobility. When they realized the importance, it was still only talked about as “it’s important to stretch” but still, nothing specific, no drills, no things to work on if you had squatting problems but were fine elsewhere. Heck even today, I’ll talk to bodybuilders just over 40 and they just started figuring out that they can’t just start the workouts like they used to anymore. They need to do some dynamic stuff to get loose before getting under the bar. And still, nothing specific. Some random leg kicks, a band here and there but pretty undocumented and random. Many books are still 100% focused on nutrition (ever aspect of it) and training to the intensity of that last rep and yet … the mobility section doesn’t even exist. If it does, it roughly mentions a 5 minute treadmill walk, a few sets of the exercise to get warm and hit it! I looked it up, long story short, I found a ton of videos and started doing them. It opened my eyes to a world I’ve been missing. I had no idea of how to perform basic maintenance on myself for various body parts. I had no idea that this guy Kelly Starrett was some type of mobility expert that could help me in my own bodybuilding lifestyle. Kelly Starrett says position and the application of position through movement are what matters most. If you can’t get into a good position because of tissue restriction of some type, then stretching by itself won’t give you the results you want. What will work is a system that helps you diagnose the issues with the initial movement and seeks to address the problem at the root cause. Becoming a Supple Leopard is a movement based approach to enhancing athletic performance. There’s no reason in this day and age that we can’t take something from this group and apply it over here. I think the CrossFit community has the bodybuilding community outgunned when it comes to mobility drills. They focus on the movement first when we focus on the execution of the exercise. Why not take the ideas proposed by the mobility experts of CrossFit, apply it to bodybuilding, work on mobility, fix that shoulder, work out the impingement thru specific drills and get back to pressing and building muscle? This site is about becoming a supple leopard thru specific mobility workouts that you can do pretty much anywhere. It’s not just static stretching. It’s not just leg kicks. It’s very specific drills you can do that take about 5 minutes a day to work on. Get to those tight spots and fix them. Let’s become a supple leopard together! If you are in a rush, you should start with the very first MobilityWOD (workout of the day) that is called the First of Many Beat Downs. 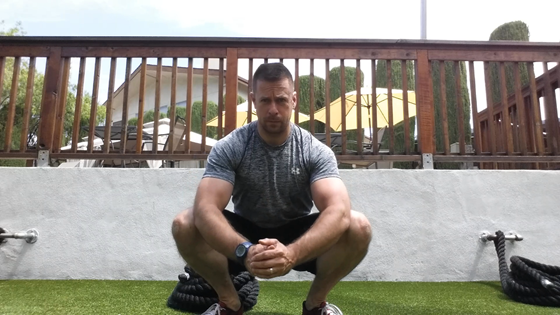 It’s a 10 minute squat that will open your eyes to the issues you may have.